There's an interesting feature of Garde-Vérité not listed here: it detects hidden demons, similar to a Demon Hunter's Vision spectrale but it does so in a different way. 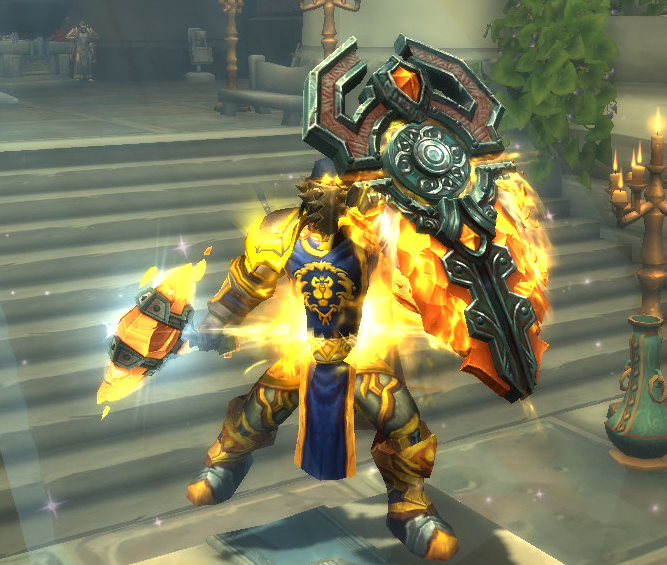 While out in the world, the shield will glow brightly and you get the Truthseeker buff when a hidden demon is nearby. You don't need to target or even find the demon first, the shield will turn itself "on", signaling you to search for it in the vicinity. To get the exact locations of the NPCs that trigger this, which appear as friendly NPCs but are lootable, once revealed and killed, check this list of hidden demons and see user comments for each one (not sure about the ones in Dalaran). These were previously thought to be involved with acquiring Simulacre de Marche-mort, but since there's a mechanic for Paladins to see them too, that wouldn't seem likely. In reality, for the Demon Hunter appearance all you need is to kill Débâcle which is not hidden at all! :) As for rewards from these hidden demons for either Paladins or Demon Hunters (or any other class with demon detection buff/consumable? ), they just seem to be "extra" rares, dropping a small amount of artifact power and resources, once per character (with a trackable vignette like other rares).